The frustrated feelings over an injured body, a failed season and an uncomfortable role with his first year with the Lakers all spilled out when Steve Nash persistently spent this summer rehabbing. Then, shortly before training camp began Saturday, Nash was informed about a statistic that he’d hardly want lumped into his resume as a two-time NBA MVP and league’s fifth all-time leader in assists. 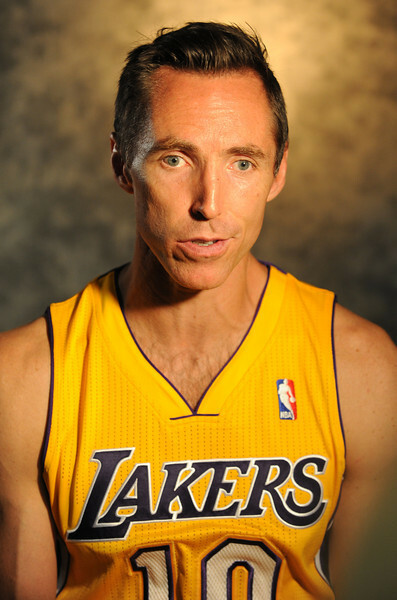 Nash, at age 39, also represents the NBA’s oldest player. He fractured his left leg and stayed sidelined for most of November and December. Nash then experienced hamstring and hip issues that kept him out for three weeks in April and the Lakers’ last two playoff games. Nash never could provide a compelling sequel to Mike D’Antoni’s fast-paced, pick-and-roll offense that he ran to near perfect through four seasons with the Phoenix Suns. Nash’s 6.7 assists represented four fewer per game than the previous season. Nash has tried avoiding that scenario by rehabbing enough on his back and hamstring until it fully healed, enabling him to spend the past four to six weeks participating in full-court scrimmages during the Lakers’ informal workouts. The Lakers are trying to avoid that scenario by limiting Nash’s minutes in hopes that it would both preserve his health and his greatness. D’Antoni also has debated whether he would sit out Nash for certain games, particularly on back-to-backs. San Antonio Spurs coach Gregg Popovich has typically adopted that strategy to his aging stars, Tim Duncan and Manu Ginobili. Nash didn’t have that luxury that season. He fractured his left leg in only the second game of the season. Then, the Lakers hired D’Antoni to replace the fired Mike Brown. D’Antoni remained strapped with the lack of a full training camp, but he considered it a non-issue once Nash would return. Seven weeks passed by before that happened. The Lakers problems persisted even when Nash returned, and the reasons went beyond his shaky defense. The Lakers’ offense never found consistency, ranging from injury limitations to Dwight Howard (back) and Pau Gasol (knees), Howard’s resistance to pick-and-rolls, Gasol’s reduced effectiveness as a facilitator and Kobe Bryant’s incredible consistency. Nash still averaged 12.7 points on 49.7 percent shooting, but he never found the right comfort level as both a point guard and a de-facto shooting guard. The Lakers believe they can reduce Nash’s role on the team this year because of the increased point guard depth. Both Steve Blake and Jordan Farmar boast speed, pick-and-roll savviness, feisty defense and abilities to play at both point guard and shooting guard. That marks a vast upgrade than last season when Blake missed 37 games because of persisting abdominal and groin issues, while an unproven veteran (Chris Duhon) and undeveloped player (Darius Morris) filled in during Nash’s absence. D’Antoni plans to use training camp to figure out the ideal minutes for Nash and whether Blake or Farmar will serve as a the primary backup point guard. But there appears to be a balancing act. As much as the Lakers want to preserve Nash long-term, they only have to refer to last season when his absence became sorely missed. After all, that mindset has ensured Nash to stay in the league for so long, even if it’s caused the 18-year-old veteran to feel slightly embarrassed he’s an old man playing in a young man’s league. Yet Nash sounds determined for the fight against Tony Parker, Chris Paul, Russell Westbrook, Deron Williams, and, of course, Father Time. This entry was posted in Lakers, Steve Nash by Mark Medina. Bookmark the permalink.